With excitement building for the new Ghostbusters reboot, hitting theaters this summer, Sony Pictures Home Entertainment is using the release to bring the animated series The Real Ghost Busters back on DVD. The entire series, which spanned seven seasons and 140 episodes, was released through a Time Life Entertainment boxed set back in 2009, but it was only available for a limited time. Now fans can enjoy at least a part of this series again with a new DVD release on June 7. Here's an excerpt from a Sony Pictures Home Entertainment press release issued earlier today. "Also, as part of the excitement surrounding the arrival of the new film, SPHE will release over 50 episodes of the iconic 1980s animated series, The Real Ghost Busters, on DVD July 7 and on Digital, from Ivan Reitman, DiC and Sony Pictures Television." It isn't known if the digital release will feature HD transfers of the original episodes, but we'll have to wait and see. The animated series ran from September 13, 1986 to October 5, 1991, set after the original movie, following Dr. Peter Venkman, Dr. Egon Spengler, Dr. Ray Stantz, Winston Zeddemore, their secretary Janine, their accountant Louis as they chased ghosts throughout New York City, with the help of their faithful mascot Slimer. The show was continued by The Extreme Ghostbusters, which is currently streaming on Hulu. If that wasn't enough, Sony is also re-releasing Ghostbusters and Ghostbusters 2 in Ultra HD on June 7. Fans will now be able to experience particle beams and ectoplasm like never before when Ghostbusters and Ghostbusters 2 debut June 7 on next generation 4K Ultra HD disc with High Dynamic Range (HDR) from Sony Pictures Home Entertainment (SPHE). Perfect for Father's Day gifting, each 4K Ultra HD release will also include the recent anniversary Blu-rays, bursting with all the bonus materials, including previously released legacy content, commentary and the interactive Slimer Mode. 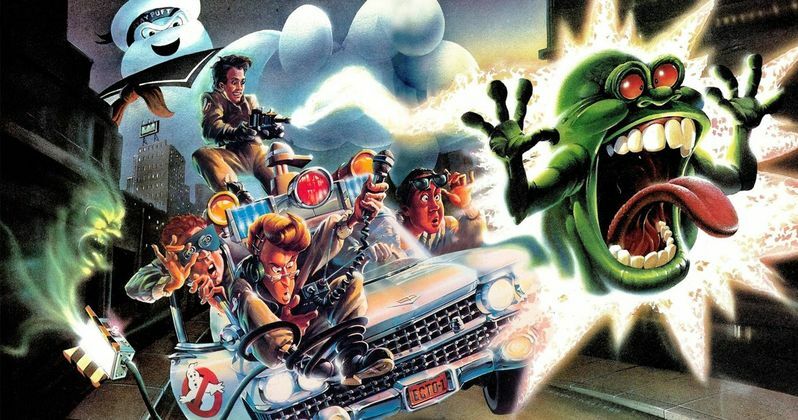 We also have cover art for both Ghostbusters and Ghostbusters 2 Ultra 4K releases below. As two of the first Sony 4K Ultra HD disc releases, both films were fully restored from the 35mm original camera negatives, thereby utilizing in 4K the full resolution, detail and color depth inherent in the film. 4K Ultra HD is the perfect way to finally experience these comprehensive restorations at full 4K resolution in the home - it features four times the resolution of high definition, along with High Dynamic Range (HDR), which produces brilliant highlights, vibrant colors and greater contrast on compatible displays. Additionally, both films have been remixed specifically for the home theater environment with Dolby Atmos audio, delivering captivating sound that places and moves audio anywhere in the room, including overhead. These new 4K Ultra HD releases precede the July 15 U.S. premiere of Sony Pictures' highly anticipated new motion picture, Ghostbusters, from director Paul Feig, starring Melissa McCarthy, Kristen Wiig, Kate McKinnon, Leslie Jones and Chris Hemsworth.Both Ghostbusters and Ghostbusters 2 are directed and produced by Ivan Reitman (Meatballs, Stripes), and written by Dan Aykroyd (My Girl) and Harold Ramis (Knocked Up). Bill Murray (St. Vincent), Dan Aykroyd (The Blues Brothers), and Sigourney Weaver (Aliens) star, along with Harold Ramis (Groundhog Day) and Rick Moranis (Honey, I Shrunk the Kids). Ernie Hudson (TV's Oz) and Annie Potts (TV's Designing Women) also star. Ghostbusters is ranked No. 28 on the AFI's List of America's Funniest Movies. Ghostbusters centers on university parapsychologists Dr. Peter Venkman (Murray), Dr. Raymond Stanz (Aykroyd) and Dr. Egon Spengler (Ramis) lose a research grant when their experiment methodology is proven to be bogus. The team decides to go into business for themselves and open Ghostbusters, a ghost removal service. After struggling to get on their feet, they are summoned to investigate the strange happenings in Dana Barrett's (Weaver) Central Park West apartment. What they discover is that all Manhattan is being besieged by ghosts and other-worldly demons through a portal in her building. Ghostbusters 2 finds supernatural superstars Peter Venkman (Murray), Dr. Raymond Stanz (Aykroyd) and Dr. Egon Spengler (Ramis) spring back into action when the infant son of Dana Barrett (Weaver) becomes the target of a powerful demonic force. Reunited with their industrious secretary Janine (Potts) and the nerdy, near-sighted Louis (Moranis), the 'heroes of the hereafter' must put a stop to an enormous underground river ready to rot the roots of the entire Big Apple. The 4K Ultra HD Releases include the Feature films in 4K resolution with High Dynamic Range (HDR) Dolby Atmos soundtracks (Dolby TrueHD 7.1 compatible). The 4K Ultra HD releases will come with all of the Blu-ray special features. To experience Dolby Atmos at home, a Dolby Atmos enabled AV receiver and additional speakers are required, or a Dolby Atmos enabled sound bar; however, Dolby Atmos soundtracks are also fully backward compatible with traditional audio configurations and legacy home entertainment equipment. The Ghostbusters Blu-ray Special Features include Who You Gonna Call: A Ghostbusters Retrospective - Roundtable Discussion with Director Ivan Reitman and Dan Aykroyd (Part 1), Poster Art Gallery - Gallery of 1988 artwork, Ghostbusters Music Video - Ray Parker, Jr. and Slimer Mode, a Picture in Picture and Trivia Track. There will also be Commentary with Ivan Reitman, Harold Ramis & Joe Medjuck, 10 Deleted Scenes, 1984 Featurette, Cast and Crew Featurette, SFX Team Featurette, ,Multi-Angles, Ecto-1: Resurrecting the Classic Car and Ghostbusters Garage: Ecto-1 Gallery Storyboard Comparisons. The Ghostbusters 2 Blu-ray Special Features include Time Is But A Window: Ghostbusters II and Beyond - Roundtable Discussion with Director Ivan Reitman and Dan Aykroyd (Part 2), Deleted Scenes, "On Our Own" Music Video - Bobby Brown and Theatrical Trailers. Ghostbusters has a run time of approximately 105 minutes and is rated PG. Ghostbusters 2 has a run time of approximately 108 minutes and is rated PG. Take a look at the artwork for these Ultra HD releases, and stay tuned for more details.